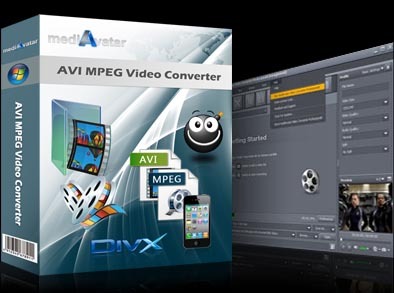 Convert AVI to MPEG or MPEG to AVI video effortlessly with mediAvatar AVI MPEG Video Converter. Almost all high definition and standard definition video formats can be converted to AVI, MPEG1. MPEG2. DivX videos. Video altering features include trimming, splitting, output file size customizing and more. With mediAvatar AVI MPEG Video Converter, possibilities are endless! Download mediAvatar AVI MPEG Video Converter for free right now. It couldn't be easier! Almost all general video formats can be converted to AVI/MPEG video like convert AVI to MPEG, WMV to MPEG, MPEG to AVI. By introducing NVIDIA® CUDA™ and multi-core CPU processing technology, this AVI MPEG converter offers maximal AVI to MPEG video conversion speed and promotes the MPEG to AVI conversion speed according to your CPU performance. Provide general and advanced parameter settings: video quality, video codec, channel, bit rate, frame rate, etc., to help you convert a personalized video. By setting the start time and duration, you can get any segment from video file with mediAvatar AVI MPEG Video Converter. Get spot-on file size with the bit rate calculator tool. If the file is too large for you, you can split a large file into several smaller files according to the common disc size, custom size or time. If you love a certain scene in the video, just take snapshot and save as picture file. Run AVI MPEG converter software in background and attend to other tasks; save time and avoid waiting by setting an action (shut down, exit, stand by) or hibernate after a conversion is done. Get several videos converted at the same time by batch processing and multithreading mode. Download and convert YouTube/FLV Videos to various video formats and audio formats.